"If you want to get into his work, guess how many colors are represented in the various pieces on display. 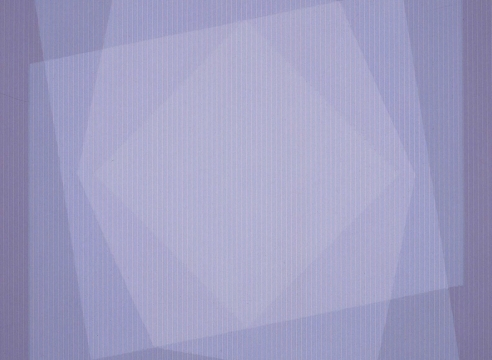 For instance, Stanczak used simple black and white in one of his transparencies pieces called “Intravert I.” When studied and mused upon, a viewer can begin to see other shades – purple somehow coming through as one tone. In his “It’s Not Easy Being Green,” one might think in this grid work that there are two basic colors being employed – blue and green. On closer study, there are actually 45 different colors. How does the artist do it? How indeed. You can see, if you look closely enough that Stanczak juxtaposes color and manipulates the closeness or distance between separations of colors. Stanczak may begin by painting a canvas black or white, or green or blue, and then applying stripes of tape (from his own tape machine) in varying distances between lines before he applies the second, or 44th color. According to him, the eye does the rest by making connections and applying some kind of order to what it is looking at." Line Color Illusion: 40 Years of Julian Stanczak showcases paintings and prints collected by the Akron Art Museum since 1970. The exhibition documents both Julian Stanczak’s impressive career as a master of color and the museum’s longstanding commitment to his work. A longtime resident of Northeastern Ohio and retired Cleveland Institute of Art professor, Julian Stanczak earned international recognition as a pioneer of “Op Art,” a style based on optical illusion, following his first New York exhibition at Martha Jackson Gallery in 1964. Soon after, Stanczak’s work--which he characterizes as perceptual abstraction—was included in the Museum of Modern Art’s landmark exhibition The Responsive Eye. Stanczak has continued to draw upon his deep understanding of color theory to explore how colors interact and are perceived. While his signature motifs have evolved, his paintings and prints over the years are characterized by lines and colors that set up vibrations and create pulsating patterns. 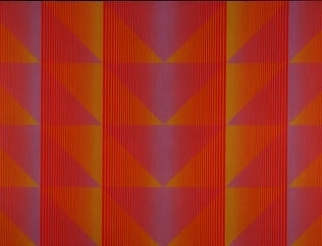 The Akron Art Museum hosted one of the first public museum exhibitions of Julian Stanczak’s work and acquired the painting Dual Glare in 1970. Since that time the museum has augmented its collection with paintings and screen prints representing the variety of materials, techniques and formal elements that Stanczak continues to explore. This exhibition is organized by the Akron Art Museum and made possible by a gift from the Kenneth L. Calhoun Charitable Trust, Key Bank, Trustee.